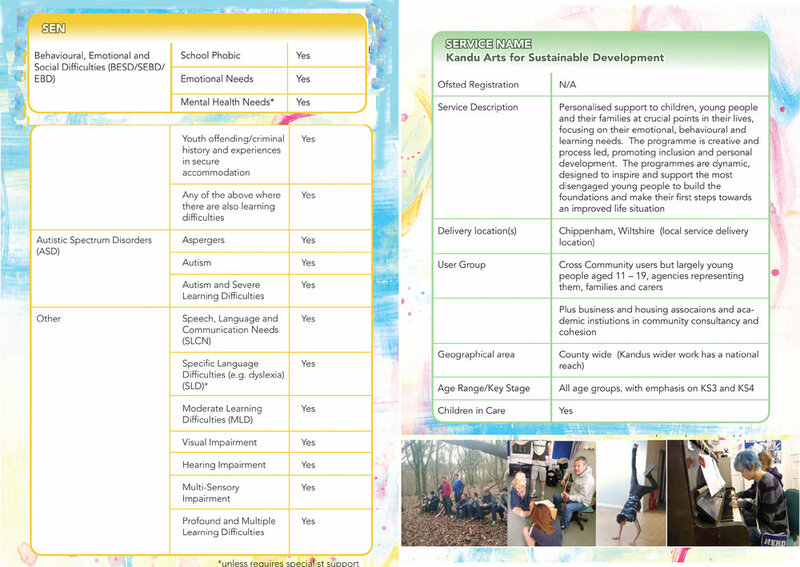 Throughout the year we deliver bespoke, accredited, term-time alternative provision programmes for young people in Wiltshire, Swindon, Somerset, Berkshire, who are not in mainstream school at all times. We take referrals from Social Services, Youth offending teams, Looked after Children Teams (Virtual schools), mainstream schools, special schools and colleges. We offer individual packages to young people according to their needs, with high levels of support and offer a nurturing and developed curriculum encompassing creative arts, life and social skills development through tailored activities, mentoring, study support, accredited Arts Award qualification, access to ongoing educational and training opportunities and Kandu Projects outside term time. Aside from our continued close working with Virtual schools for Swindon, Wiltshire, Bath and North East Somerset in the delivery of Alternative provision and projects to looked after young people of, Kandu has worked with carers, foster carers and social services on a range of projects giving voice and opportunity to young people in the Care system Focus, in partnership with Swindon Borough council and Swindon Social services was a video and drama project involving a large number of looked after young people to explore and produce informative works relating to the Key to care, their experience of care and to inform and engage parents, foster carers, schools, media and social services. All Kandu Practitioners and staff have full enhanced DBS checks, safeguarding and first aid training along with continuing professional development in areas particular to our user groups. For more information and to access this programme please explore the brochure.